From the same people who brought you the hexadehydro-Diels-Alder reaction (HDDA), there is now the aromatic ene reaction (Niu & Hoye DOI). 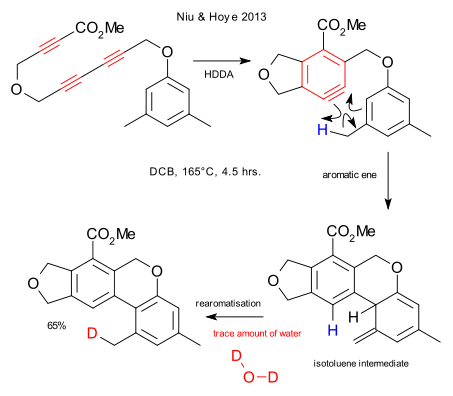 The HDDA reaction is a cyclotrimerization of a linear triyne to an aryne. This thermal reaction does not require any reagents and does not leave side-products so the aryne is produced very cleanly. In the subsequent aromatic ene reaction the ene is the methyl hydrogen and the enophile the alkyne. The potentially competing DA reaction is energetically less favourable. The isotoluene intermediate (known to chemistry but very obscure) quickly rearomatises. This step requires a trace amount of water (solvent dichlorobenzene). The isotoluene to toluene isomerization is symmetry forbidden but any proton donor can catalyse the reaction by proton shuttling. With deuterated water, deuterium is prominent on the reformed methyl group. Bored with NaCl? Try NaCl2! or NaCl3, 4, 7?. Reduce your sodium in an unexpected way. Instructions here. NaCl7 is stable at pressures in excess of 142 GPa but the definition of stable here is a broad one: anything more stable than any competitor at the given physical space. The crystal structure is cubic with 4 sodium atoms on the corners and a central chlorine icosahedron. At elevated pressures chlorine is no longer much larger than sodium making these sort of structures possible. The material was prepared in a diamond anvil cell from NaCl with additional chlorine and laser heating and then analysed with XRD and Raman. With thanks to In The Pipeline for the alert, a new open-source chemical database has launched called SureChEMBL / Surechem. The venture boasts a collection of 9 million chemical structures from patents, half of which are not contained in another database. Registration is easy: as often, even the telephone number is mandatory but otherwise the sign-up process is not a hassle. Surechem offers searches by text query (anything from patent number to company to any wildcarded keyword) or by structure (chemwriter drawing tool). Sticking to the chemical structure theme, searches can include the exact match or any substructure. For example a query for the blockbuster drug aripiprazole yields 313 substructures. While waiting for the results to come flooding in you are treated to a real-time graph developing the number of results found against time which is cool and pointless at the same time. Each of the 313 structures provide access to any number of patents and each patent has a full description (testing was limited though) and presented in a human-friendly way. Compare that to many existing patent websites offering just a summary with or without ugly graphics. Unable to find out as yet: an option to return to a structure or finding out how the subqueries work but then the venture is only beta. Only problem to work out for the SureChEMBL builders: how to get rid of this antiquated wood-panelled background? A very recent blog from the builders here contains an ambitious list of future plans but no mention of building a reaction database. Why? See previous report on chemical databases here.